Running brands mixed business and fun during the Comrades Marathon’s Expo held at the Durban Exhibition Centre from 28-30 May leading up to the main event. 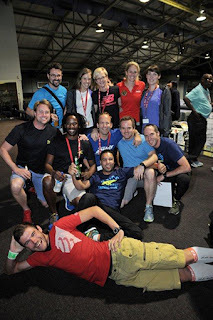 In the true Comrades spirit, representatives from the different brands competed against each other during the event, and partied together afterwards. This year’s Comrades Marathon made history by having two South African winners for the first time since 1992. Major running brands and retailers were among the 110 exhibitors showcasing their new running shoes and gear to the estimated 50 000 visitors. 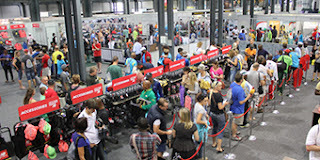 The 2015 edition of the Comrades Expo attracted many runners. New Balance - official technical sponsor of the marathon - created excitement with their Comrades 890v5 running shoe and a selection of replica training gear they developed with the Comrades Association to celebrate the 90th edition of the marathon. Two ladies in New Balance gear. Designed for both men and women, the Comrades running gear feature innovative materials and technologies that help a runner keep cool, safe and dry. The Comrade 890v5 shoe, with an 8mm drop, features a blown rubber outsole, absorb crash pad and no-sew material. New Balance shoes on display. Mizuno also made their presence felt at the Expo. 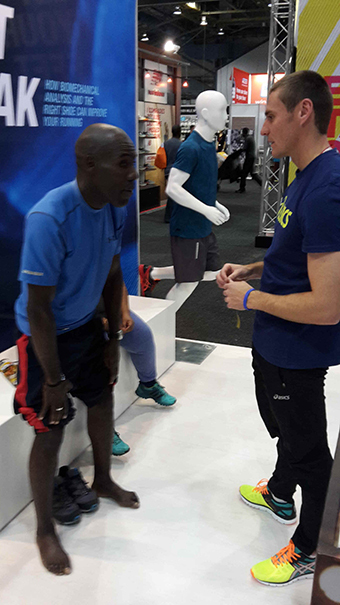 “There was great energy at the Comrades this year with a new floor layout and a new race director driving passion for comrades back into the heart of the runners,” says brand manager Paul Copson from local distributor Brand ID. Paul Copson and Thando Siyendo of Brand ID and Kevin Lodge from Top Events. Representatives of different brands enjoyed the post-Comrades party. 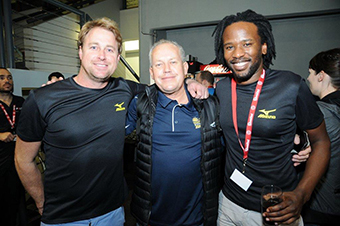 Copson this year had the “honour” of wishing Jax Snyman of the Sweat Shop “happy birthday” during the post-Comrades party – a practical joke that has become an annual institution. 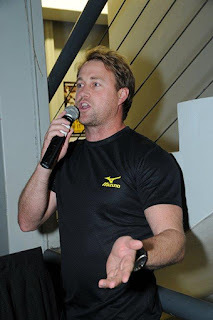 Paul Copson wishing Jax Snyman fo The Sweat Sweat Shop a happy birthday. Asics showcased their shoes in all the running categories - ranging from training, natural, fast, long or trail running - as they focused on the mix up your run philosophy. The brand also had a free Foot ID service available, where runners were given information on their foot shape, size, foot types and what running shoes would best suit them. Asics had freelance students as their technical representatives. 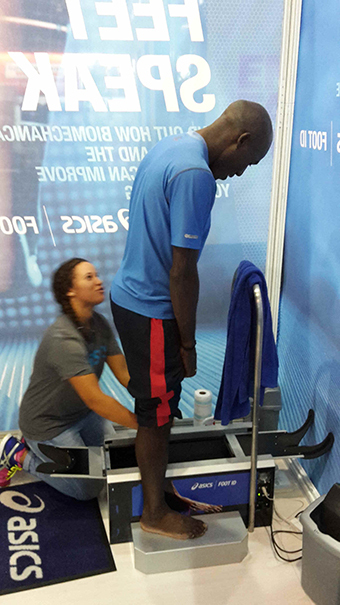 One of the reps assists a runner with the Asics Foot ID free service. 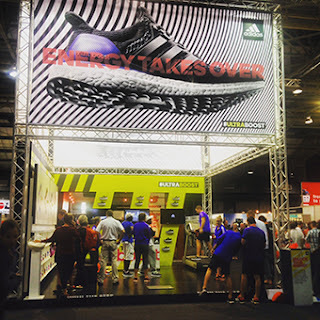 Adidas focused on their Ultraboost running shoe at their stand during the Expo. 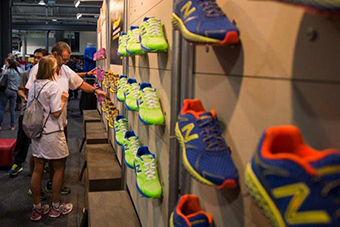 Runners flocked in to see and experience the shoe first hand. Runners flocked at the adidas stand to check their Ultraboost shoe.